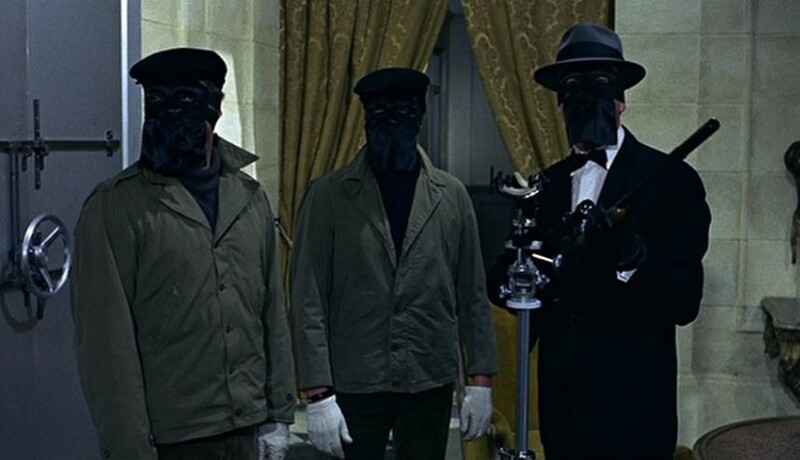 Le Cercle Rouge (1970) screens in the Film Center's Melville retrospective on June 3 and June 8. In the body of film history, the career of Jean-Pierre Melville represents a crucial piece of connective tissue. Melville may not have been the first French filmmaker to take inspiration from American crime films, but he did so more openly and with greater relish than any other before him. His 1950s crime tales, Bob le Flambeur (1956) and Two Men in Manhattan (1959) are madly cinephilic works that wear their influences on their sleeves. The characters are all but defined by their American cars and clothes, while the style of these movies is so ripe and self-aware that one never forgets that they're in the world of the Movies. With its low budget and movie-mad attitude, Bob le Flambeur was a key reference point for the directors of the French New Wave, who looked to Melville as a godfather. Melville turned in cameos in a couple of major New Wave films, Jean-Luc Godard's Breathless and Eric Rohmer's The Sign of Leo, and he reportedly provided Godard with advice when the younger director was editing his first feature; moreover, Francois Truffaut, Louis Malle, and Claude Chabrol turned to Melville's regular cinematographer, Henri Decaë, to shoot their early works.) His later, more austere crime works, among them Le Samouraï (1967) and Le Cercle Rouge (1970), were key influences on such Hong Kong directors as John Woo and Johnnie To, who were inspired by these works when developing their own style in the 1980s and '90s. In short the five-week Melville retrospective that begins this weekend at the Gene Siskel Film Center is one of the key movie events of the summer, a chance to revisit or discover one of the architects of modern cinema. The series begins fittingly with two of Melville's most influential films, Bob and Cercle, before branching off into his lesser-known and more personal works. (It even features his least-revived film, the 1953 melodrama When You Read This Letter, which screens from 35-millimeter on June 29.) One week of the series spotlights Melville's collaborations with actor Jean-Paul Belmondo (Le Doulos  and Léon Morin, Priest  both screen on June 10), while the final week presents two films Melville made about France under the Nazi occupation, his debut feature Le Silence de la Mer (1949) and what is arguably his greatest work, Army of Shadows (1969). The only movies missing from this otherwise complete retrospective are Les Enfants Terribles (1950), the director's collaboration with author Jean Cocteau, and Melville's first color film, the brilliantly titled Magnet of Doom (1963). Léon Morin, Priest screens in the Melville series on June 10 and June 15. Whereas Bresson's distilled film style came from his interest in spiritual themes, Melville's was rooted in physical experience. One cannot overstate the influence of Melville's wartime experience on his cinematic output. The director fought in the French Resistance during the war (it was at this time that he first adopted the pseudonym of Melville, one of several code names he would take when evading capture), and he'd later say that this time was the happiest of his life. From the Resistance, Melville learned the significance of camaraderie, coded behavior, and subtle gestures, all of which would become central to his movies. Melville's thematic emphasis on souls in hiding may seem metaphysical to the uninitiated (and certainly this theme takes on a metaphysical element under his austere direction), but it derives from real memories of having to suppress one's identity in the name of clandestine operations. This personal connection to the material would explain why Army of Shadows is widely considered the greatest film about the Resistance, though I'd argue that the movie also informs the less overtly personal Léon Morin. My personal favorite of Melville's works, the spiritual drama Léon Morin concerns the wartime relationship between an atheist widow (Emmanuelle Riva) and a passionate young priest (Belmondo). The widow first comes to him out of curiosity about religion, then develops a true calling after months of serious debate. Her fascination with religion is clearly rooted in her unspoken physical attraction to the priest, and Melville develops a seductive tension in her conflicted motives. The director's attention to small, revealing behavior—which he typically used to generate suspense—creates a potent eroticism here. While the two characters never touch, one always senses a strong attraction between them. Yet Léon Morin is about more than unspoken desire—its ultimate concern is the unseen force of religious faith, in which the characters find solace during the Nazi occupation. Conceivably the most probing film about Catholicism ever made by a Jewish director, Léon Morin deepens the theme of tacit devotion that runs through all of Melville's filmography. Not every Melville film is as psychologically intense as Léon Morin, nor does every one reflect the sustained brilliance of Bob le Flambeur or Le Samouraï (perhaps the director needed single-minded heroes in order to best convey his ideas). Yet even in lesser works like Two Men in Manhattan or Un Flic (1972), Melville creates sequences of uncanny power, presenting criminal or police activities in such exacting detail that viewers have no choice but to get carried away by the storytelling. His obsession with process found ideal expression in both the war and crime genres, as his meticulous planning of set pieces mirrored the meticulous plotting of his characters. Melville's art was above all cinematic—working with minimal dialogue and carefully selected physical actions, he demonstrated how force and finesse could be communicated through moving images.